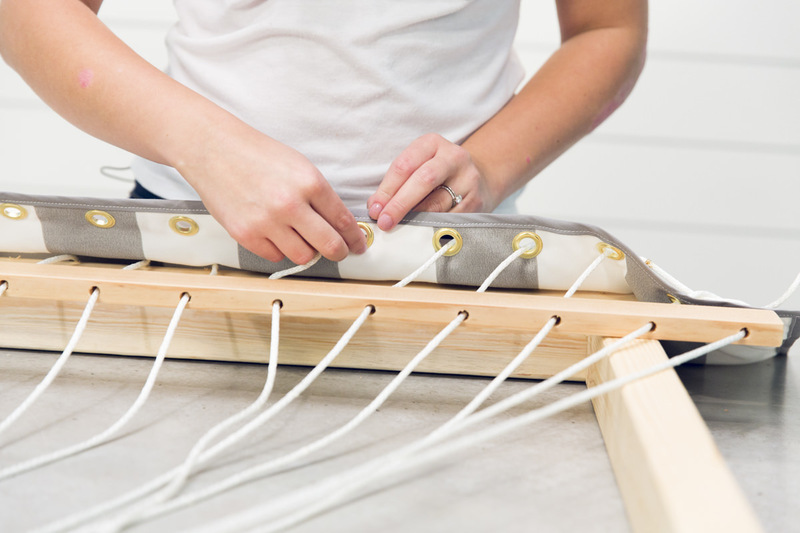 Get our monthly DIY Digest in your inbox! DIY Home Exterior Projects & Tips Print this Project! "There was some trial and error here, and I was so happy (and proud!) when I finally found success in my own way." When I was growing up, I had this tiny loom that I loved weaving on. I distinctly remember making a rainbow plaid scarf for my mother—that she never wore because it was truly terrible (sorry, mom! )—and however many years later, I’m still fascinated by the art. 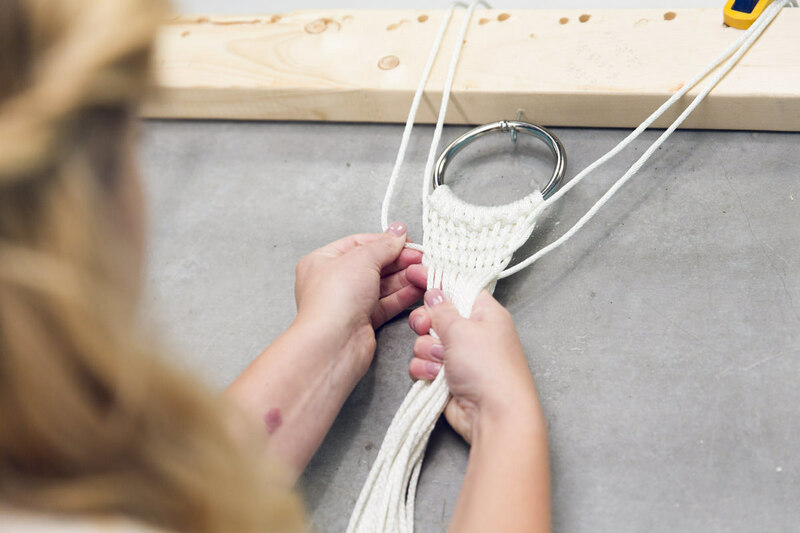 The practice of weaving on a loom applies to today’s project: a macrame-inspired hammock. Initially, I wanted to crochet the whole thing, but a little research revealed that fabric hammocks are warmer and dry out faster, which is great for the damp and dewy Pacific Northwest. No one wants to relax in a wet hammock. 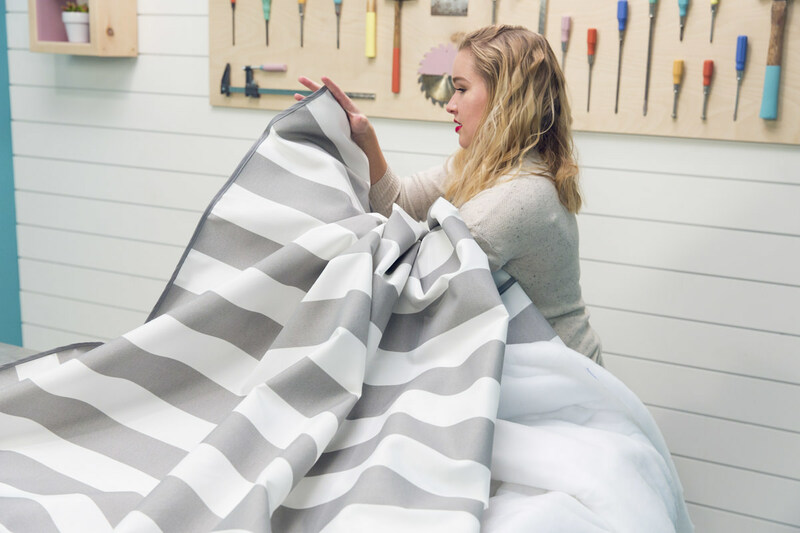 I chose a polyfill outdoor fabric, so it should hold up well under weather, but I recommend bringing it inside during the rainy winter months. This hammock (which holds two people!) 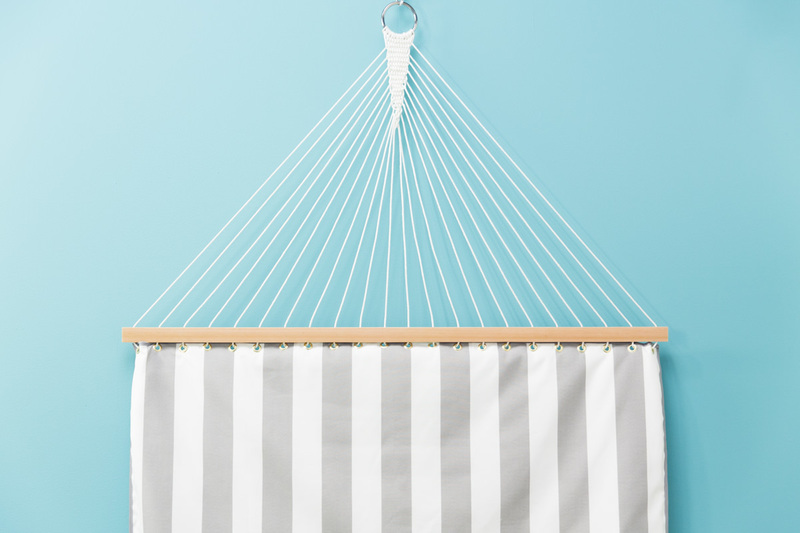 fits perfectly in our hammock stand and is the perfect addition to any outdoor oasis. What better way to spend a warm, sunny day? (Or even a slightly chilly May one?) Let’s get to it. 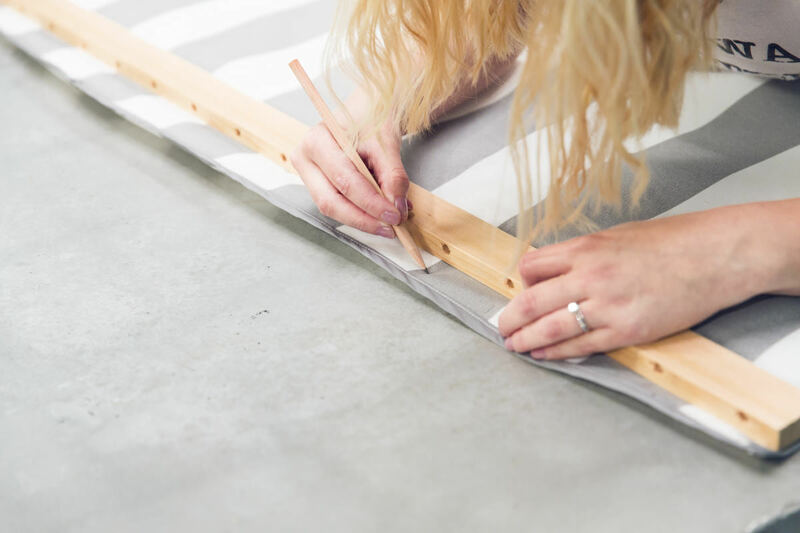 First we’re making the spreader bar (which connects the weaving to the fabric bed). I used cedar because—like the fabric—it holds up against the elements, but you can use oak, too. 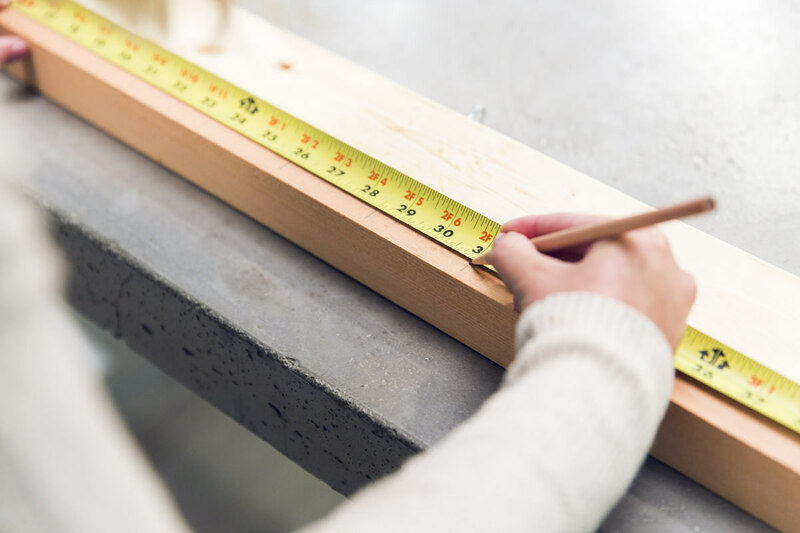 Start by cutting your one-by-twos to 54 1/2". I used a chop saw—a circular saw, hand saw, or cuts by the fine folks at Dunn Lumber work just as well. With a pencil, mark 1” in from one end on the short (3/4") side, then mark every 2 1/2" until you are 1” short of the opposite end. 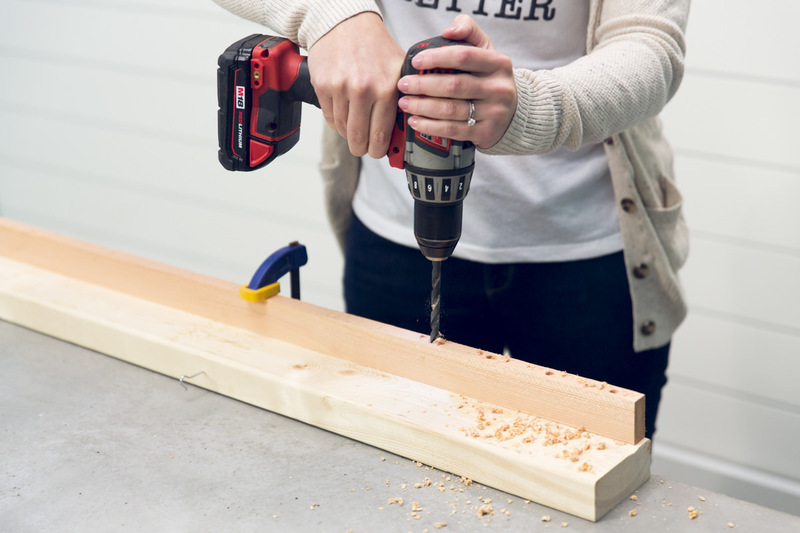 Clamp down your wood, then drill holes at the marks with a 3/8" drill bit. Make sure you’re drilling straight up and down so you aren’t breaking through the sides. You should end up with a total of 22 holes. Sand the holes smooth with a sander or sandpaper, then spray with an exterior finish, ensuring the inside of each hole is coated. 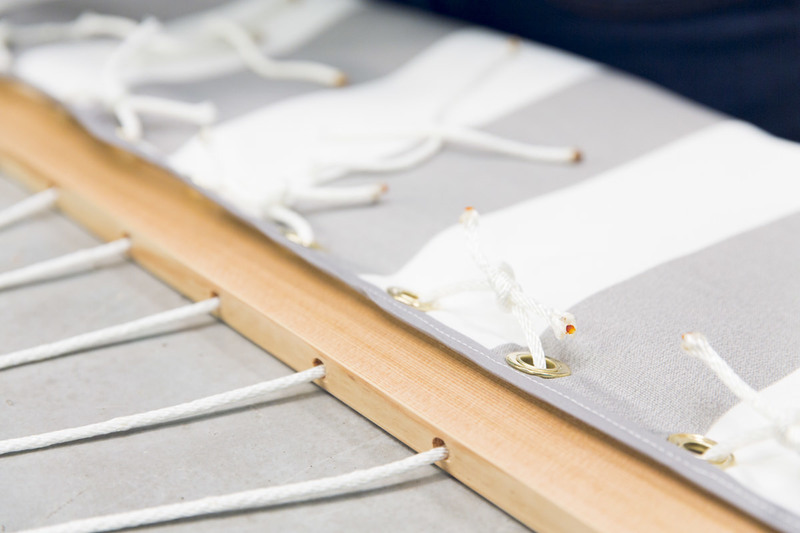 Next, it’s time to make the V-shaped weaving; this is what connects the frame of the hammock to the stand. It helps to anchor the ring to something as you do this, just like you would if you were making a friendship bracelet. I used 3/16” rope, but you can use something thinner if you’d like—just make sure it can bear the weight of at least two people. 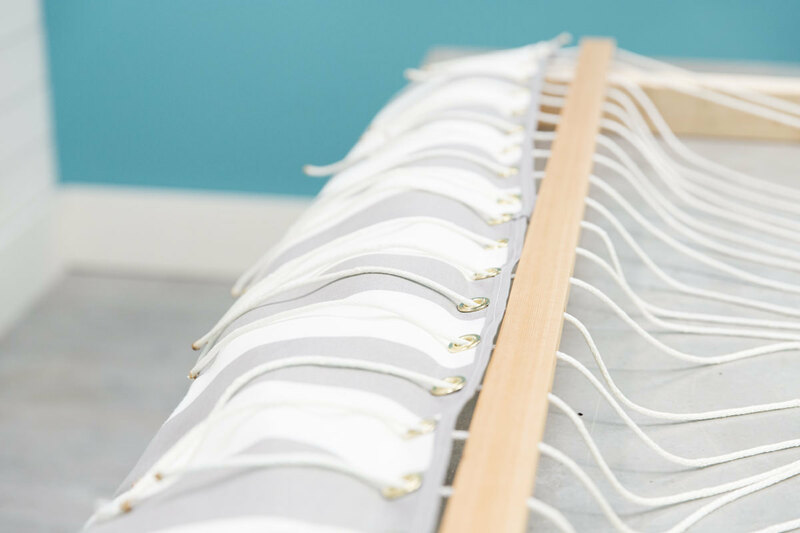 The rope packaging should include weight information—the one I used holds 50 pounds per strand, and once folded, I have 22 strands for each weaving, which means it can hold 1,100 pounds on either side of the hammock. 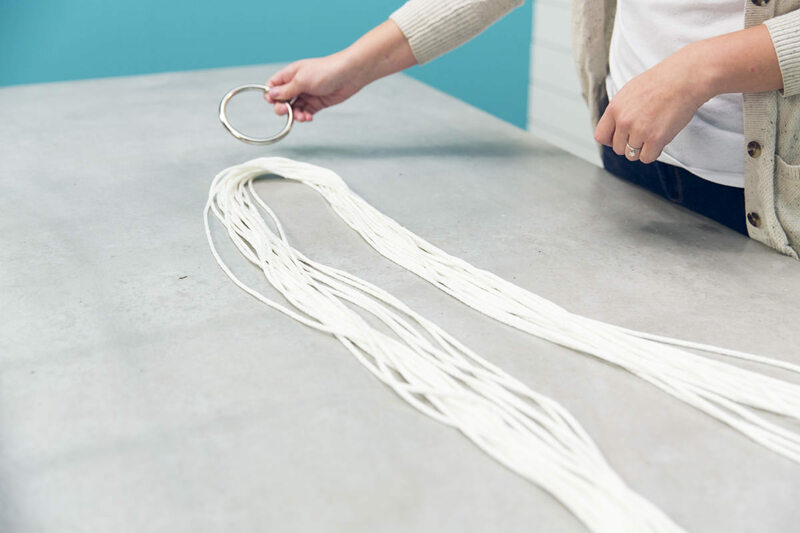 Cut 11 9’ strands for each ring—once folded, they should be 4 1/2' long. I’ve found some handy videos and photos to help with the knots—they can be tricky to get at first, so be patient! 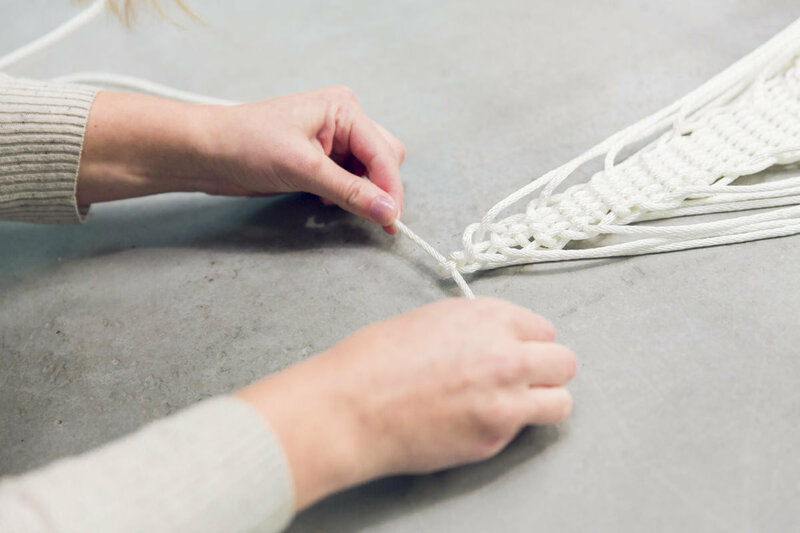 For the weaving, we’re using two types of knots: a cow hitch knot to attach the rope to the ring (make sure the ends are even), and a clew knot to create the weaving. Once you’ve started the clew knot, continue with the pattern all the way down. 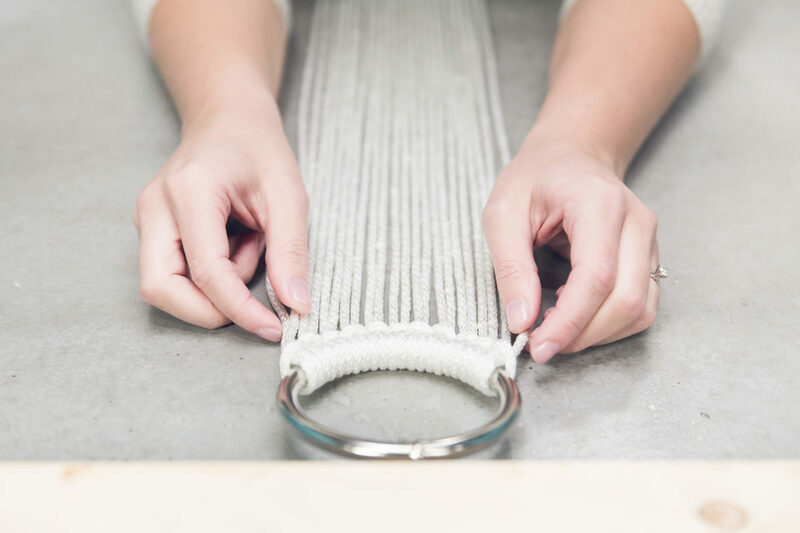 As the weaving begins to develop, you’ll want to be sure to pull each string taut as you go, and make sure the knot is tight by sliding a pencil, ruler, or even your finger between the tails and pushing the knot up. As you're making things taut, think of a loom, or, if your elementary school experience was anything like mine, think of those beaded lizards you’d make at camp as a kid. You want the weaving to be snug so the shape is clear, but you don’t want it to be so tight the weaving gets bunched up. It doesn’t matter which way the knots face, but it is important to make sure you’re taking the outermost piece every time. 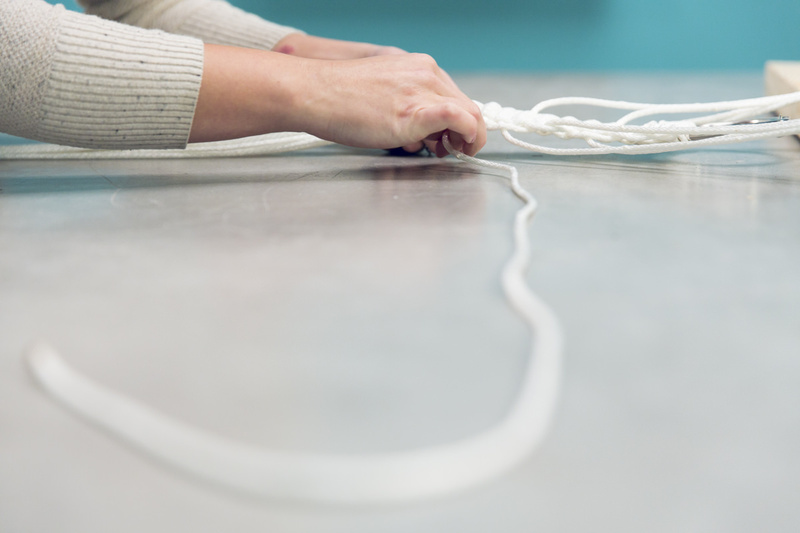 I kept making this mistake—make sure you keep the strings you've already worked into the knot out of the way to save yourself time and unnecessary frustration. When you get down to the last two strands, tie them into a square knot. Repeat this step for the other side. The bed will be the size of a full-size mattress. 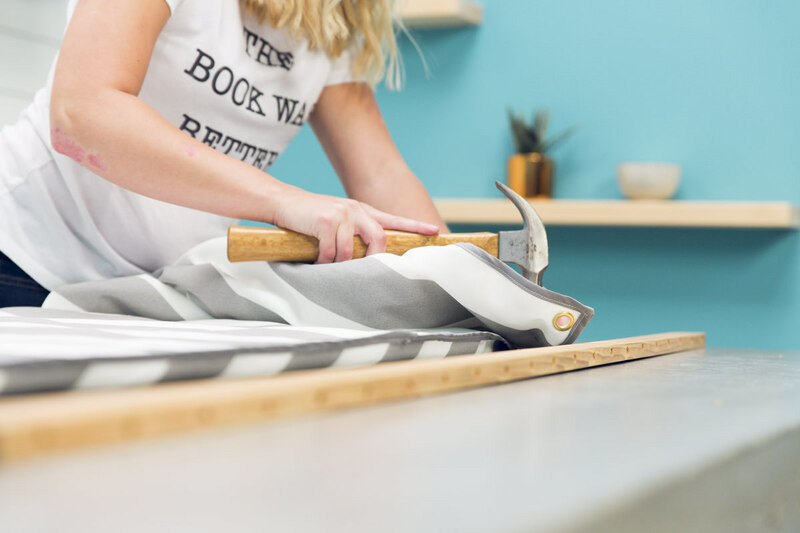 I ordered a roll of 54”-wide fabric from Amazon, but you can find something at your local craft and hobby store, too—look for an outdoor polyester or something similar that will hold up in damp conditions. 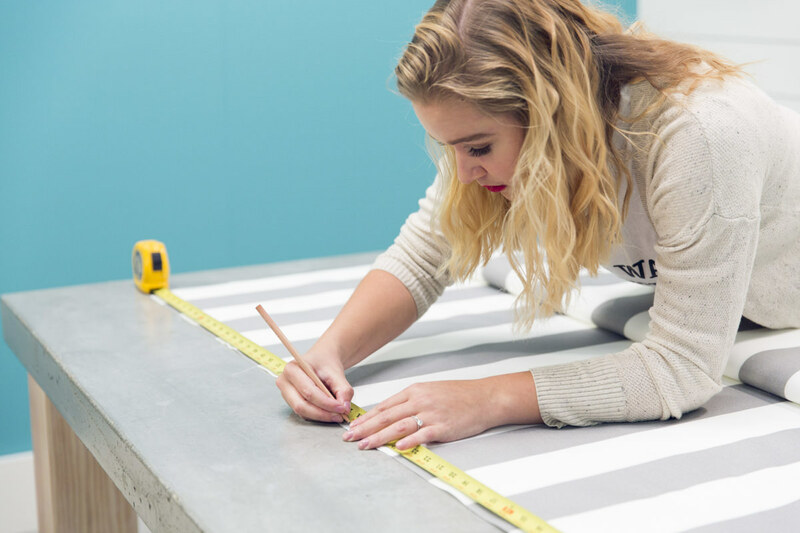 To start, measure out the fabric and cut two 7’ long pieces. 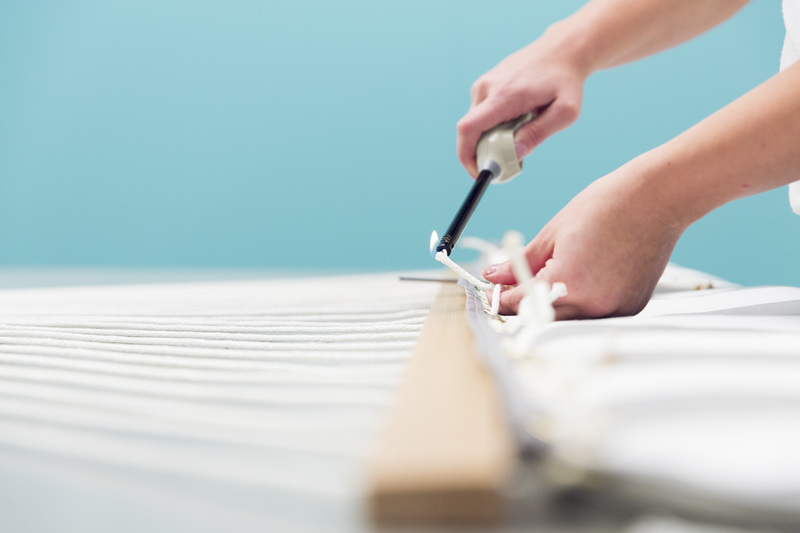 We're going to cut the shape so that you have a slight convex curve on either end—do this so you don’t feel like you’re falling out of your hammock. (That would be bad.) 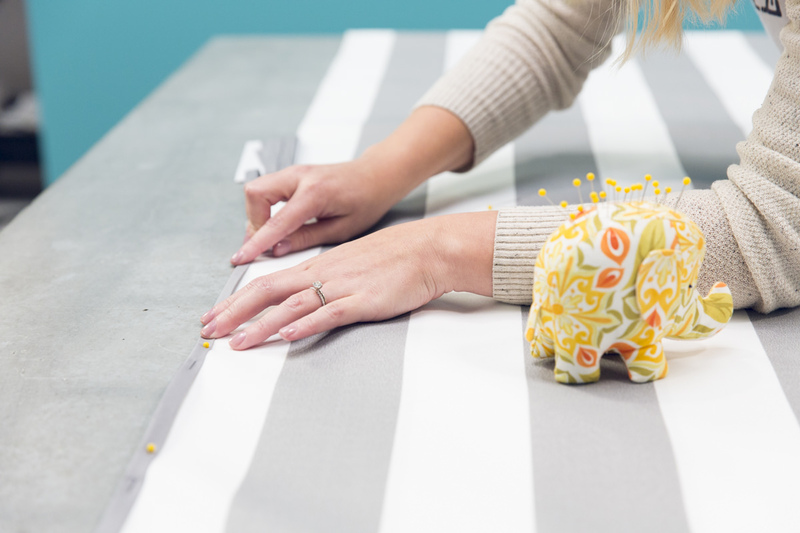 Measure in 1 1/2" from the end and make a mark on both sides of the fabric. 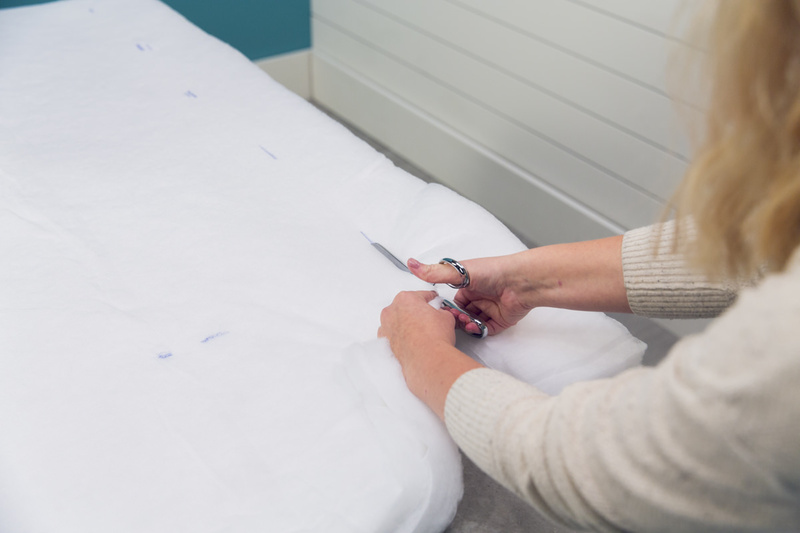 Draw a line from each of the marks to the center point of the fabric, creating a slight "V" shape (which will be 1 1/2" based on the previous marks you made at the sides of the fabric). Cut along the lines. Repeat on all ends. Instead of hemming the sides, we used bias tape. 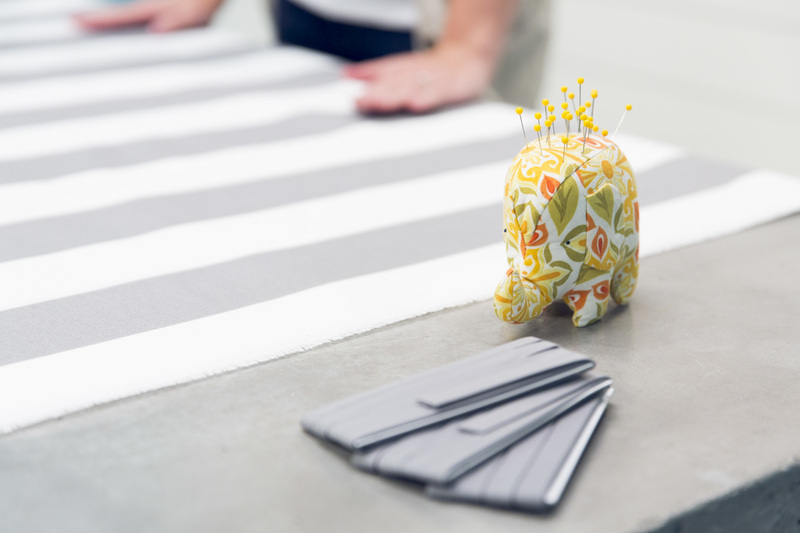 When you’re buying bias tape, make sure it’s double-fold bias tape—this ensures it encases the edges of the fabric. 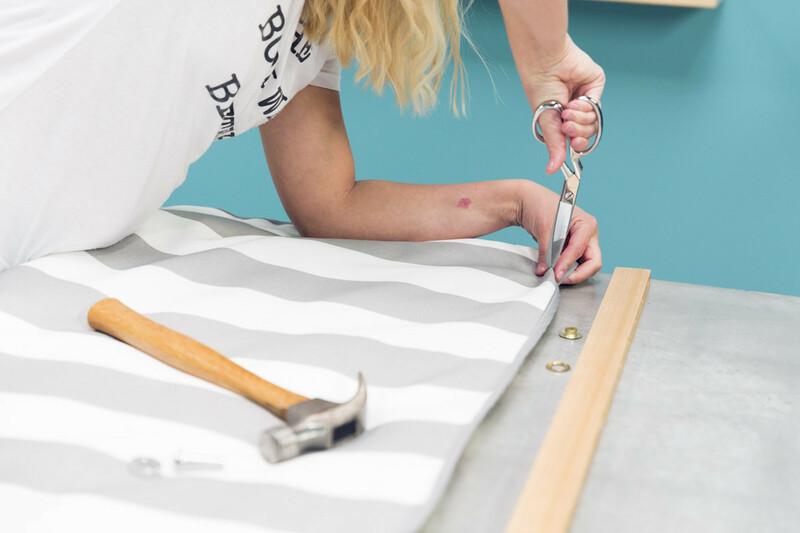 It looks professional, and because we’re using 54”-wide fabric for a 54”-wide bed, it’s a good way to hem it without losing any width. If you can find 60" wide outdoor fabric, you can hem it with a normal seam. This polyester is pretty tough fabric, so you want a specific type of thread and needle. The needle for the sewing machine is a denim needle; the thread is a polyester thread made specifically for the outdoors. With the wrong sides of the fabric facing each other, pin the bias tape around the raw edge starting on one of the long sides. Sew together 1/8" away from the edge of the bias tape. 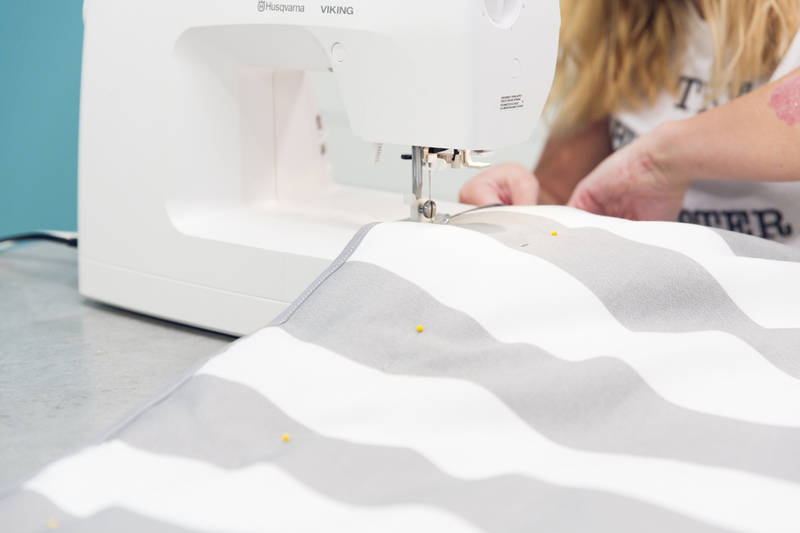 Make sure that both layers of fabric are inserted all the way into the bias tape, so you’re not accidentally sewing through only one of the pieces. I did this and then had to rip it all out—not super fun. Continue sewing around the short side, folding the tape at a diagonal to make it around the corner to the second long side. When you run out of bias tape, pin the second piece on top of the first piece with the edges folded under. Leave the remainder of the tape attached at the end of the second side for later. 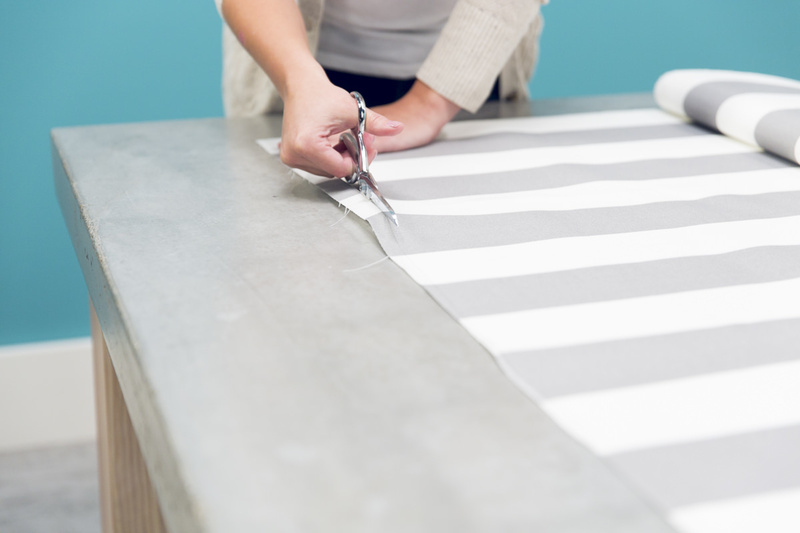 When you're done, three of the four sides should be hemmed—one short side should be open. Cut your batting to size. My batting—which feels amazingly like cotton candy—came folded, so I measured 27” from the crease (we needed 54”), marking points along the way. 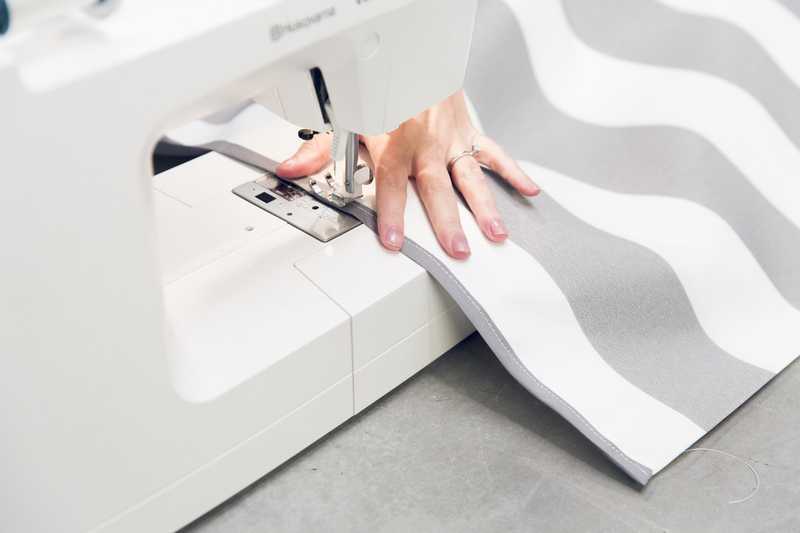 Try to match the shape of the fabric ends, eyeballing a slight curve as you cut. Stuff the batting inside the fabric sleeve and pin the far corners in place, kind of like a duvet—this may take some finagling. Trim off any excess, then sew on the final piece of bias tape, remove the pins, and fold it over so no raw edges are exposed. If you want to make sure the batting really stays put, you can always sew some quilting lines through the bed. 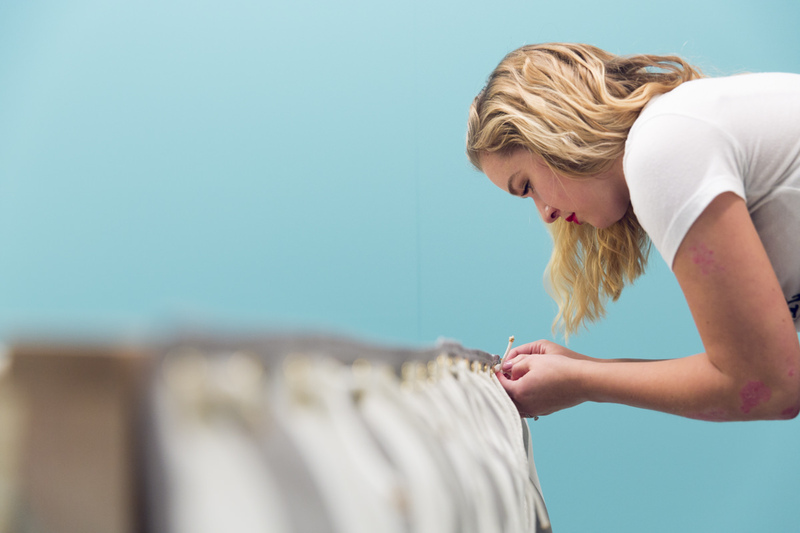 If you do this, add a ton of pins so everything is completely flat and won’t shift—once you push it through the machine, you don’t want anything to move around. 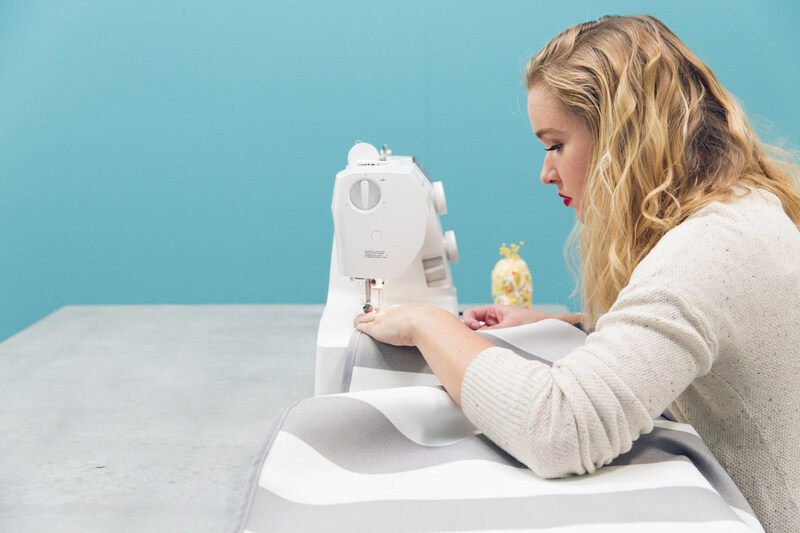 Sew dimples by hand if you want to avoid the sewing machine. It’s a great way to add a personal touch and get creative with buttons or accent thread! To connect the bed to the spreader bar, we’re using grommets. Center the spreader bar on the end of the fabric and mark the middle of all the holes onto the fabric—you should have 22 total. I picked up a bunch of grommet packages from my local sewing store and spent nearly $100. I recommend purchasing these online; I bought 25 grommets for $10. I opted for brass because they hold up well outside. 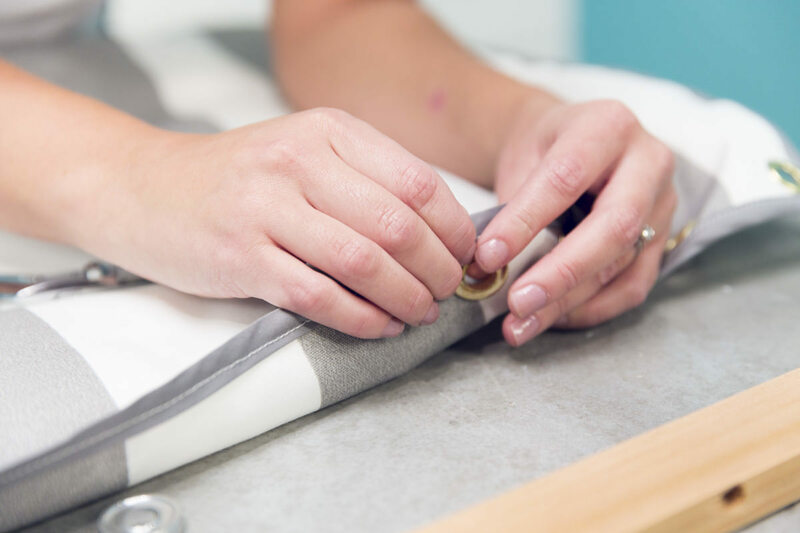 Take the back of one of the grommets and use a pencil to trace the inside circle on the fabric. You'll want to place this precisely and at a consistent distance from the edge for a clean, professional look. Cut a small, x-shaped slit, taking care not to overcut it and wind up with too big of a hole. You can always enlarge the hole later if need be. Hammer a grommet in each hole. 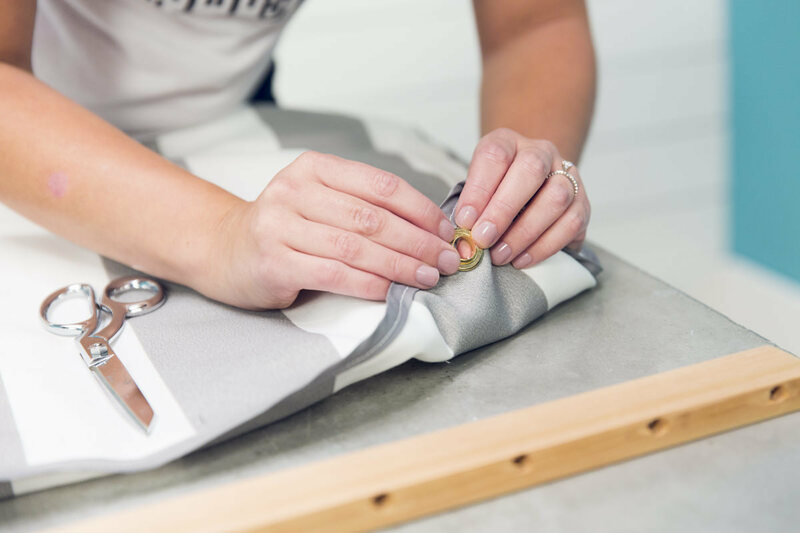 I bought a special grommet hole-punching tool that cuts through leather and heavy-duty fabric with the help of a hammer, and it wouldn’t cut through even a single layer of this fabric, so scissors it was! Now it’s time to connect the bed to the spreader bar. I had a simple frame loom that I built for one of my first hammock attempts. I used this as a frame to stretch out the V-shaped weaving so everything would be taut and even, but all you really need is a rectangular piece of wood with a nail or screw at the top to hang the ring on. The distance from the bottom of the frame to the nail should be about 35”. The width of the frame can vary; it just needs to be wide enough to keep the spreader board straight. You can use a pallet you have laying around, or even your workbench to accomplish this. 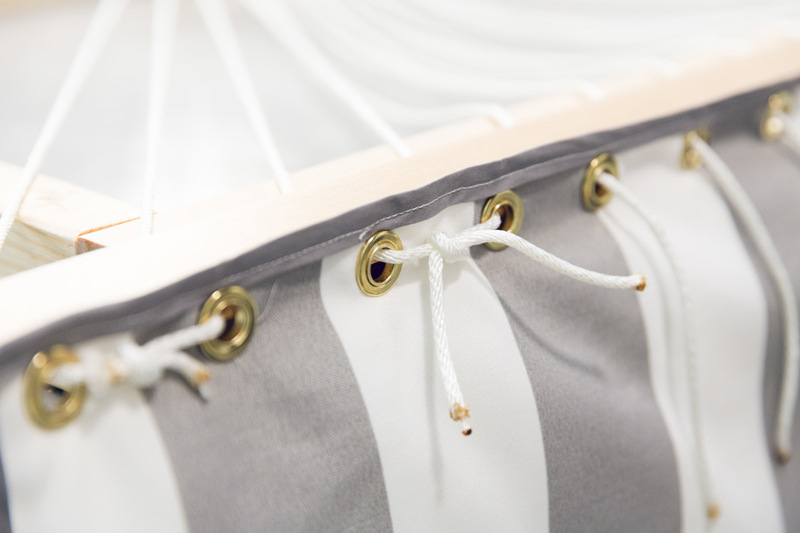 To connect all the pieces, make sure you’re threading the rope through the spreader bar and then through the front side of the grommets and tying the knot on the backside. If you’re detail-oriented, you’ll want to make sure both of your clew knots are facing the same direction. 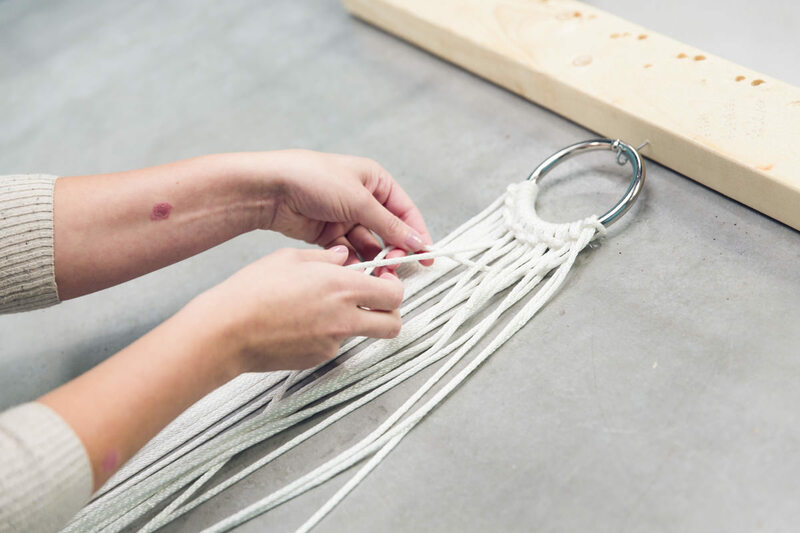 Hang the ring from the nail on your frame, then, using the bottom of the frame as a stopper to hold the spreader bar in place, pull the weaving tight and tie each pair of ropes with a square knot. If you need to reinforce the square knot, place a dab of super glue in the middle of the knot to help hold it in place. Tie knots starting with the very middle two strings, then move to the outside two on either side. 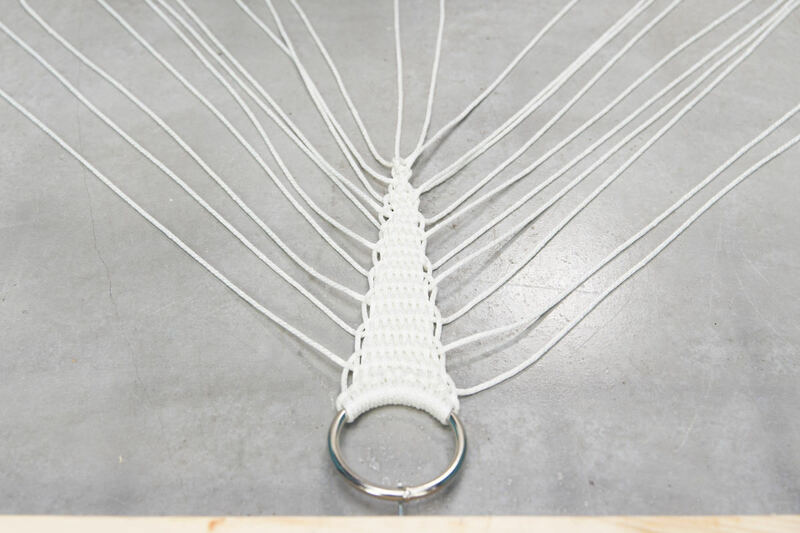 The idea is to have three separate knots across as a reference so the tension remains equal. Once you’re finished, trim all the excess rope so the rope tails are even and burn the edges with a lighter so they don’t fray. I burned the tips of the rope before I threaded them through, so if you do this, you'll have to repeat the step. Be careful not to light your hammock on fire! I used a carabiner and a quick link to attach 12” of chain to the hammock ring and to the eye hook on the hammock stand. The carabiner attaches to the eye hook on the hammock stand; the quick link attaches to the hammock ring. The nice thing about this project is that it’s accessible—you don’t have to build a loom to weave a clew knot (though my first attempt did include an ill-fated one); you don’t have to macrame an entire hammock. It’s attainable. That said, it also requires presence of mind. Coming up with my own hammock tutorial was a challenge. There was some trial and error here, and I was so happy (and proud!) when I finally found success in my own way. 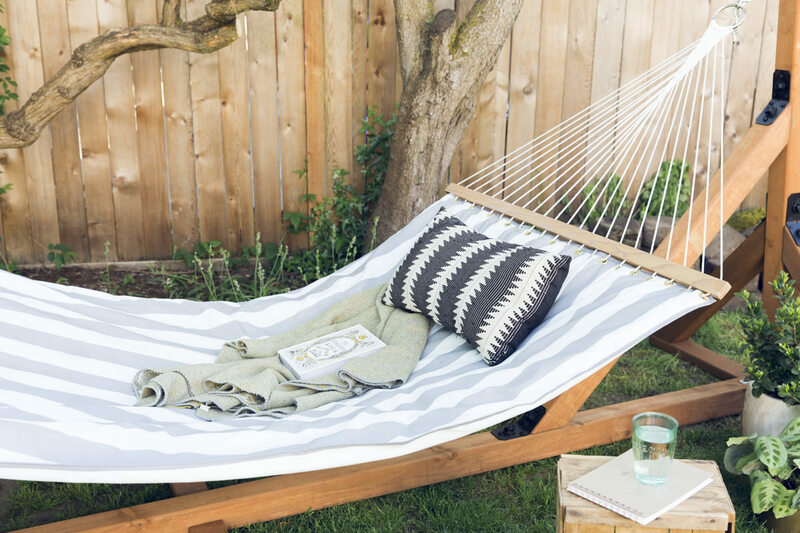 Plus, there’s the obvious—there’s nothing better than relaxing on a hammock, book in hand, surrounded by throw pillows, blankets, and sun. Stay tuned for the next part of this series: the hammock stand. Where do you need a coat rack? You can personalize today's project in several ways. 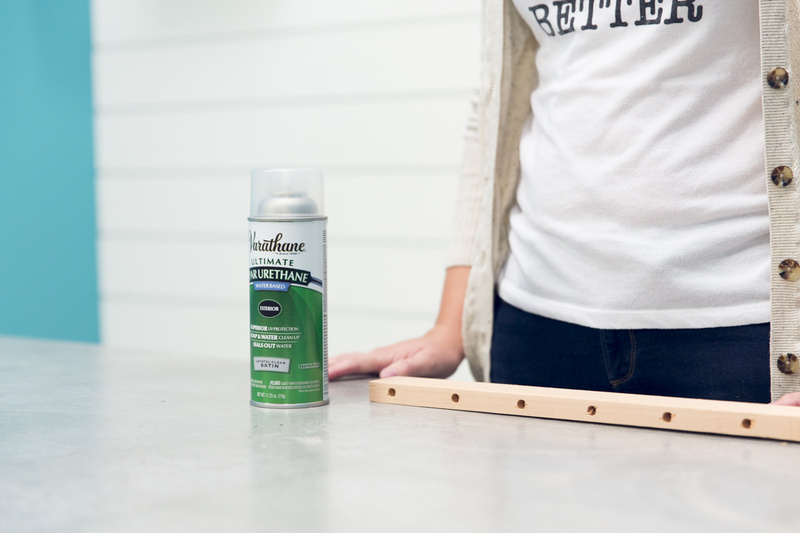 The first coat rack is a perfect project for a nursery! The second one is a little more versatile. Head over to Dunn DIY and learn how to build your very own! We visited Swansons Nursery to find some great cocktail herbs, and we're sharing tips to help you grow your very own herb garden—it's convenient, saves money, and smells amazing! Spring is here, and we're arranging flowers! Just in time for Mother's Day. Get our monthy DIY Digest in your inbox! 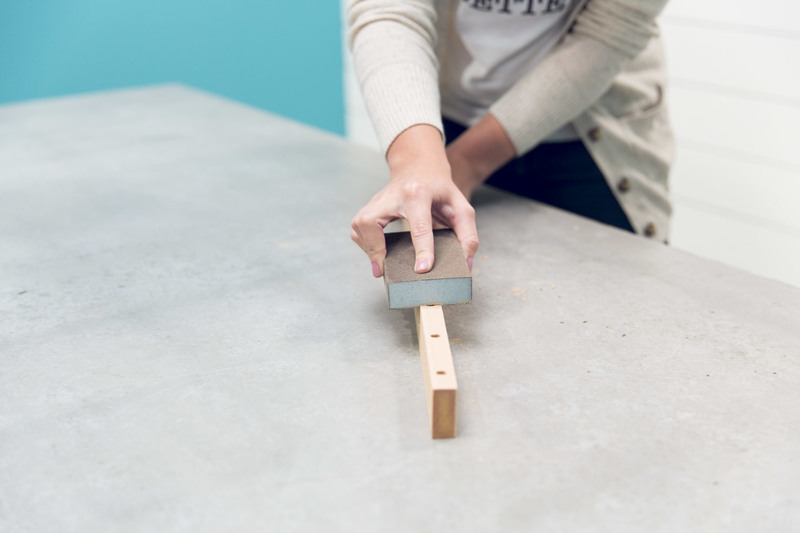 an online community where Seattle do-it-yourselfers can find and share tips, tricks, and step-by-step instructions for home improvement projects. The use of this site is an acceptance of the Dunn Lumber Terms and Conditions. Dunn Lumber and its partners cannot and do not guarantee the accuracy or completeness of the information, materials, or advice on dunndiy.com.